The Romanian Cultural Institute organizes and conducts Romanian Language, Culture and Civilization Courses in the 12th century citadel of Braşov. The program is organized in collaboration with the Faculty of Letters of Transilvania University - Braşov, Mureşenilor Memorial House and Reduta Cultural Centre. A multicultural environment, Braşov (Corona, Kronstadt, Brassó) was renowned not only as an important medieval trade centre, but also as a cultural and academic ”fortress”. Braşov is also known as the place where the first spark of an anticommunist uprising was lit in November 1987. The Romanian language courses are taught according to a flexible syllabus and adapted to the students’ requests and needs. In order to develop the fluency of expression and to strengthen previously learned grammatical structures, the vocabulary and grammar exercises are alternated with individual and group communication activities. The reading syllabus includes texts about everyday life, as well as literary texts, press articles, songs, etc. These instructional media are supplemented by the use of audio-visual teaching materials. The instructors selected for teaching the Romanian classes are chosen primarily for their professional skills, but also for their friendly attitude, enthusiasm and patience. Participants are enrolled in several study groups that are selected and formed based on an initial language test that evaluates the students’ level of linguistic competence, according to the Common European Framework of Reference for Languages (A1, A2, B1, B2, C1, C2). Each group consists of approximately 8-12 students. The beginners’ level aims to obtain simple comprehension skills, as well as to communicate in familiar situations. The intermediate level develops the comprehension abilities of more complex texts, as well as competencies in written and oral communication, on various topics. The advanced level – students will improve their skills of understanding long and complex texts, appreciating distinctions of style as well as improving their communication skills through the use of nuanced expressions. At the end of the programme, students will be given a written and oral exam. 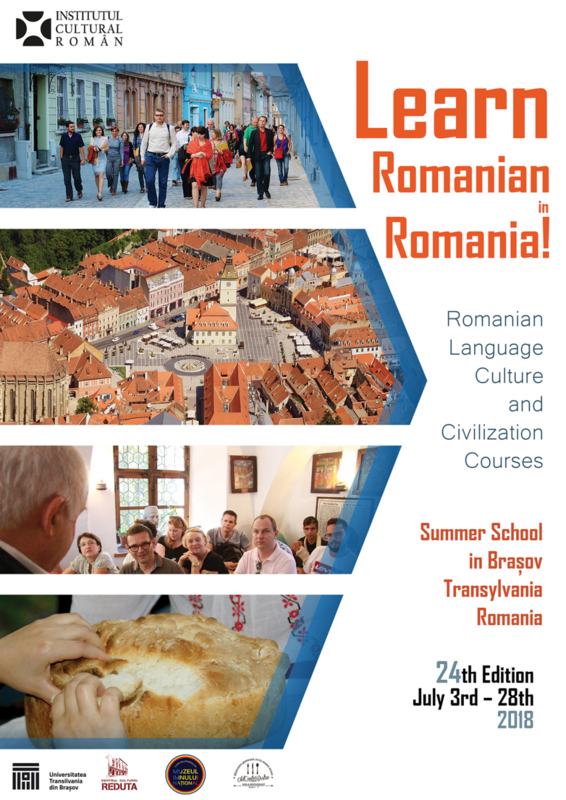 Upon succesful completion of the course, the Faculty of Letters of Transilvania University – Braşov will award the participants with certificates of language proficiency, and the Romanian Cultural Institute shall present the students with a certificate that indicates the level of Romanian language knowledge the student has achieved. Transilvania University of Braşov grants 3 (three) credits for this program in the ECTS system. The Romanian Cultural Institute invites and provides a public forum for university professors and researchers and other notable figures in Bucharest and Braşov to give lectures that cover history, cinema, literature. The talks are given in both the English and Romanian languages. Participants will attend Romanian film screenings once a week. The film productions are selected from works by renowned Romanian film directors (with a particular accent upon the New Wave Romanian Cinema) and recipients of important awards at great European film festivals as well as screenings of Romanian classics. During the weekends we have scheduled sessions of cultural documentation in the Old City of Braşov, on the Transfăgărășan, which is one of the most spectacular routes in Romania, also known as the “route in the clouds” (a road that ensures, in fact, the connection between the historical region of Wallachia and Transylvania); another historically significant landmark in our trip throughout the country will be Cetatea de Baltă, with its Bethlen Haller Castle, considered to be a monumental combination of Renaissance architecture and Baroque influences; we also plan to have a visit ina traditional Romanian village etc. These site visits benefit from the informed comments of young historians, sociologists, and art historians, specialized in researching the region, its history, traditions and the rich socio-cultural and ethnographic milieu existing in this area of Romania. An international evening will be organized for the participants, who are asked to present the specific customs, foods and drinks, objects and other things relevant to the countries they come from. This event is followed by a party. The accommodation will be in three-star location in Braşov in the city center or at a short walking distance from it. Language classes will take place at the Faculty of Letters of Transylvania University - Braşov. The workshops will take place at the Mureşenilor Memorial House (www.muzeulmuresenilor.ro), and the Old Center Bistro. Lunch and dinner are served at the Old Center Bistro, a downtown located restaurant (www.oldcenterbistro.ro). The fee covers all expenses related to the activities included in the program. Alumni are granted a 15% discount. The participation fee does not cover international and domestic transportation, entrance visa, extra hotel services (mini-bar, phone calls, etc. ), non any medical services. The Romanian Cultural Institute warmly recommends that participants have a health insurance that is valid for Romania. - a copy confirming the payment of the participation fee. Due to the limited number of places, applications should be sent as soon as possible. SWIFT CODE: RNCB RO BU. Please write the applicant’s name and ”Braşov” on all the documents relating to bank transfer of funds. All bank charges are the responsibility of the applicant. The minimum age required for attending is 18 years old. The organizers will provide a detailed program of the courses, as well as a daily schedule. Any change that may occur will be announced. Each participant has the responsibility to be informed about the structure of the program, the conditions and terms of participation, and any changes that may appear in the program. In the event that a participant decides to no longer attend the courses or decides to drop out of the program for a serious reason, he/she has the obligation to inform the organizers in writing as soon as possible. The partial reimbursement of the participation fee is granted only under exceptional circumstances. The organizers are open to the participants’ suggestions and will be glad to answer any question the participants might have. The Romanian Cultural Institute is offering six (6) full scholarships which cover entirety of the participation fees. These are destined to be accessed by students of foreign Romanian studies departments (2 scholarships), by researchers interested in Romanian cultural studies (2 scholarships) and by cultural promoters of Romania (2 scholarships). - a letter of recommendation from a professor or a person who is familiar with the candidate’s professional activity. The deadline for application for the places exempted from participation fee is April 30th, 2019. Applicants should send all application documents by this deadline, including the completed application form, CV and copy of their passports. Applications will be evaluated by a jury comprising 3 persons as independent evaluators. The Romanian Cultural Institute has the right to make changes in the program of the courses in case of unexpected events.